In the late 1980s, Harley-Davidson beat back an assault by Japanese competitors and engineered a remarkable financial turnaround. But it subsequently faced an even more formidable challenge: maintaining and improving on its success in the absence of an external crisis. 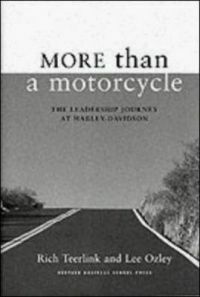 To answer this challenge, then-CEO Rich Teerlink, partnering with organizational consultant Lee Ozley, threw out the top-down strategies that had just saved the company and began building a different Harley - one that would be driven not by top management, but by employees at every level. What happened next is the stuff of turnaround legend. "More Than a Motorcycle" is the story behind the story of the purposeful transformation of an American icon, as told by the two individuals most deeply involved in that decade-long process. The book chronicles the victories and setbacks along Harley's difficult journey from a traditional 'command-and-control' culture to an open, participative learning environment. Teerlink and Ozley deliver three fundamental messages: people are a company's only sustainable competitive advantage; there is no 'quick fix' to effect lasting, beneficial organizational change; and, leadership is not a person, but a process to which everyone must contribute. They provide practical, reality-tested prescriptions for critical tasks like developing employee alignment, building structures that support participation, and implementing effective reward programs. Finally, they draw lessons from the Harley experience - lessons about values, trust, and community - that apply broadly to any business. An against-the-odds story of a business road less traveled, this book encourages today's leaders to look around the next bend-and to give every employee a view of the road from the driver's seat. Rich Teerlink is the retired Chairman and CEO of Harley-Davidson, Inc., and speaks internationally to corporate and educational institutions. Lee Ozley is an organizational consultant and coach. Both are Corporate Fellows at Auburn University's Graduate School of Business. Rich Teerlink is the retired Chairman and CEO of Harley-Davidson, Inc. Since retirement, he has been speaking internationally to corporations, industry organizations, and educational institutions.